Whilst the main focus of Amiga Pd is to concentrate on public domain and shareware games from the 1980s and 1990s we will also occassionally cover commercial games, especially if they become available as Freeware. 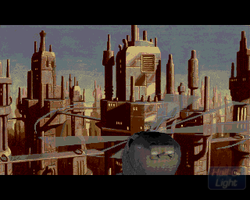 This is the case with our interview with Tony Warriner, one of the creative minds behind a favourite game of ours Beneath a Steel Sky (the Amiga version is available as freeware). 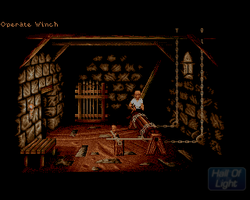 To find out more about this game and Tony Warriner's involvement with the Amiga read on. Questions starting with a * are additional questions asked by Lifeschool from the Lemon Amiga Forum. Are Beneath a Steele Sky and Lure of the Temptress now available as Freeware? Yes, all our Amiga stuff is freeware. Is it true that your first game Obsidian was written whilst you were still at school? 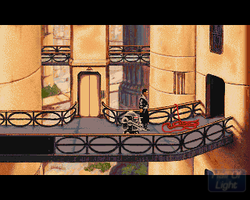 What attracted you to the Point and Click genre? In the late 1980s Point and Click games were a much larger genre than they are now, so we weren't heading into some weird niche, as such. Charles Cecil was particularly interested in story and narrative, and we all played these games, so it seemed like a sensible way to go. Also, when we looked at what companies like Sierra were doing, we felt we could do something better..
What were the advantages of the Virtual Theatre engine over other point and click engines such as those used by Lucas Arts SCUMM and Sierra's Creative Intrepreter? Our idea was to try and create more of a living world, with autonomous characters wandering around. You see a lot of this in Lure of the Tempress. Although we achieved it, technically, it was hard to design for, so gradually scaled it back over the coming games. We could have gone the other way and used it more, but I suspect if we had then the resulting games would have been less adventure and more RPG type genre. 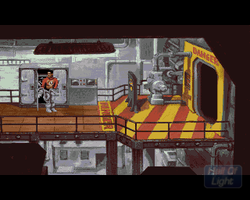 What was the inspiration behind the graphic style of Beneath a Steel sky? The style was very much driven by Dave Gibbons. He did all the screen designs on pen and paper, and we simply coloured them in and added animation. Where did you get the inspiration for the story of Lure of the Temptress? That's a good question and it's hard to answer accurately as with that game we pretty much made things up as we went along. The tempress, for example, wasn't part of it until the last couple of weeks of development. Looking back, we were admirers of an 8bit game called Dun Darach (google it) and perhaps some of that came across. Which of your games are you most proud of and why? Probably Steel Sky, as it was pretty hard to do, with very limited resources, and has now achieved minor cult status. *The common myth is that BASS (as 'Underworld') was created before Lure but was released afterwards. Is this true? Screenshot taken from Hall of Light Website. Second screenshot of Lure of the Temptress - Screenshot taken from Hall of Light Website. Both games can also be downloaded from the Whdownload website. Remember you must have a registered version of WHDload. *I read your first credit on the Amiga came with the game Grey Slayer, yet in the opening titles of the game it just says "Based on an idea by Tony Warriner". Was there a story behind this? Perhaps there is!? 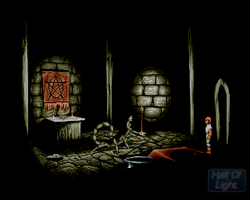 I've never until now heard of Grey Slayer, but looks alot like my Amstrad CPC game, Death Stalker. Perhaps that's the connection, or it's a total coincidence, but there can't be many Tony Warriner's out there. *Some people thought Lure Of The Temptress had a bug where the player couldn't complete the game if they did something wrong at certain key points. What's your take on this? Not that I know - but there was an anti-piracy thing where an object was taken away if the game knew it had been copied. We thought this was pretty amusing. *In Lure the player gained a friend named Ratpouch, and in BASS the player had a unique friend in Joey. What was the idea behind having these co-operative roles? We did this because we could :) As in, we had this technology that allowed us to do nice things with secondary characters, so we designed around that. But, it's good from a design perpective anyway, because the player and his friend character can exchange dialogue, which enriches the game. *Humor was also a key element in those games. Who was responsible for the majority of those jokes? *How much did Virgin get involved in the project? Is it true they put pressure on you to develop the Virtual Theatre 2 system? They had a producer who would do the normal producer type things. But it was not like working with a publisher in the present day, where so much money is involved they micro-manage a project, and in so doing, screw it up. I don't recall them having any interest in Virtual Theatre particularly. Publishers just want games to publish. *Lure came on just 4 disks but BASS came on 15! What kinds of problems did this cause? *According to a message hidden in the EXE code, the programmers also found frustration with the 1MB ram limit. Was it really so bad? If you refer to the PC version, then maybe there were some issues in those days with swapping ram pages around. I don't recall any major issues, just day to day programming stuff. *Was a CD version planned from the start, or did it just happen as a result of BASS's success? What did you think of the CD version? No, it came afterwards. CDs were much nicer than floppies! It was good to be one of the first games to have so much voice recording. *Is it true that the 'Fosters' logo (which appeared in the comic) had to be changed for the American release because the Americans couldn't earn a dime from the copyright, so in response the logo was changed to "SS IPM (RAW)", which is "warm piss" spelled backwards? Fosters' lawyers made us change it world wide, i believe. Simply because it was their trademark being used. I'd have thought we were promoting their brand, but a lot of lawyers don't have enough to do, it seems. Obviously we had our little joke as a result. *I also read that BASS was the first (and so far, only) game to be translated into Portuguese? Surely this can't be true..? It's the only game of ours to be translated into Portuguese, i think. Translations are often done by the distributors in each territory, hence the sometimes strange choices. * know Charles Cecil and Dave Gibbons have both expressed an interest in doing a BASS 2 project. Is this something you might be interested in? Are there any current projects you can tell us about? 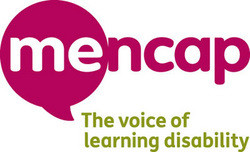 AmigaPd would like to thank Tony Warriner for agreeing to answer our questions. If you want to keep up-to-date about what Revolution are currently working visit their website.